Legazpi (Philippines) (AFP) – Intense lava fountains shot like fireworks up to 700 metres (2,300 feet) into the air above Mayon, the Philippines’ most active volcano, on Tuesday as showering debris turned morning skies dark and spread fear among anxious residents. More than 40,000 people have already fled since smoke and ash started spewing from the mountain, with scientists warning of the danger of an explosive eruption and authorities urging people not to be complacent. Mayon shot out a five-kilometre-high (three-mile) ash column early Tuesday as a rain of fine debris brought daytime darkness in some areas, volcanologists and local authorities said. “People got scared. The kids did not understand what was happening, then suddenly it got dark and you could not see who you were with,” Danny Garcia, a spokesman for Albay province, told AFP. The summit of the mountain was shrouded by a dense column of steam and hot rocks, creating fanciful shapes in the sky. “The explosion looks like a cauliflower or an octopus,” Ed Laguerta, Mayon’s resident volcanologist from the Philippine Institute of Volcanology and Seismology (Phivolcs), told AFP. “Hot ash ascends and since the volcano is conical, the pyroclastic flow seems to be the tentacles,” he added, referring to a mix of hot lava, ash and volcanic gas flowing down the volcano’s flanks. Mayon, a near-perfect cone located about 330 kilometres southeast of Manila, is considered the most volatile of the Philippines’ 22 active volcanoes. Volcanologists on Monday warned of a hazardous eruption within days as Mayon rained ash on communities two weeks after it began showing signs of unrest. 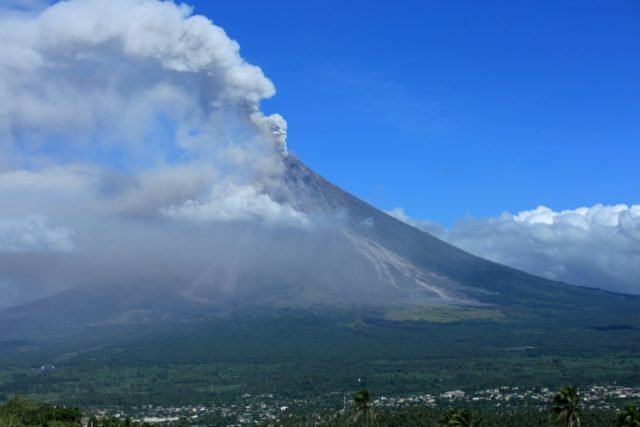 Authorities have ordered people to leave a danger zone stretching eight kilometres from the volcano and on Tuesday shut down schools and businesses in Albay province where Mayon is located. Civil aviation authorities have closed airports in the cities of Legazpi and Naga and at the nearby island of Masbate, while small aircraft have been banned from flying near the volcano. Some highways have also been closed, with ash showers making driving in some areas nearly impossible, the provincial government said. Regional disaster officials were monitoring air quality as they advised people to wear face masks, goggles or glasses and to stay indoors to avoid inhaling sulphur dioxide gas. Volcanologists told residents to heed warnings from authorities even in towns not yet affected by ashfalls. “Not all towns will be affected at the same time so people cannot be complacent,” Laguerta said. There have been 51 previous eruptions by Mayon in recorded history, the last one in 2014. In 1814 it buried the town of Cagsawa, killing more than 1,000 people.